"Nicht durch Reden und Majoritätsbeschlüsse werden die großen Fragen der Zeit entschieden — das ist der große Fehler von 1848 und 1849 gewesen — sondern durch Eisen und Blut" - Bismark. "Not by speeches and votes of the majority, are the great questions of the time decided — that was the error of 1848 and 1849 — but by iron and blood". People hates war, because it will always results in the lose of valuable life; leaving behind thousands of widows and orphans on both sides. But it doesnt stopped anyone from declaring war, history of humanity is tightly packed with the 'glorious' stories of conquering nations. The irony of the fact is that, problems between the nations are not solved by productive engagements of communities in the conference rooms but by the strength and resolve in the battle fields. The total capacity of Naxalites are not clear. According to government estimates, they have around 10,000 - 20,000 armed fighters and a lot of supporters. These groups have a strong presence in 11 states of India. Believe it or not, they are running parallel government in the forests and tribal belts of Central India and have hundreds of crores of revenue (according to government estimates) - Taxing local villagers, extorting payments from business entities especially illegal mining companies (These companies have enormous profits and paying vary small amounts in royalty to the government and in the case of illigal mining no royalty at all) and road contractors. According to the Home Ministry (GOI) the annual income of Naxalites are around 1400 crore rupees, Chhattisgarh cheif minister put it in the range of 1000 to 1200 crore. These are often the result of guess works by various authorities. Anyway it is an undeniable fact that naxalites are able to extract huge sum of money. But if intelligence reports are to be believed then there is a huge difference between the amount of money flowing to the war chest of naxals and their annual budget!!! According to the captured naxalite leaders like 'Misir Besra' annual budget is around 60 crore in 2007-09 (42 crore arms and ammunitions, 2 crore for intelligence gathering, and remaining 6 crore for transportation etc). Another polit beauro member 'Kobad Ghandy' said they are operating on 15-20 crore budget. The widespread corruption in the country only helped the anti-Indian elements in and out of the country. Now bribery become a ritual in many places, if you want some thing from government - then you have to pay the price (It will be distributed across the spectrum) to the local agents and the so called public servants (The word 'Public Servants' become a perfect example for oxymoron). Wide spread corruption really crumbling the hands of world's largest democracy not only in Maoist hit areas ( these areas have little or no accountability ) but across the length and breadth of the country. New Delhi's decision to crack down on illegal mining and the recommendation of 7th 'Administative Reform Commission's' suggestion to set up anti-extortion and anti money-laundering cell is certainly a positive development (Only if it implemented properly). In the Naxal dominated areas they are running parallel government - Tax collectors, School, Basic Health facilities (Don't ask me what they are teaching in these schools - Maoist propaganda?). The so called intellectuals often discovered (the fact?) 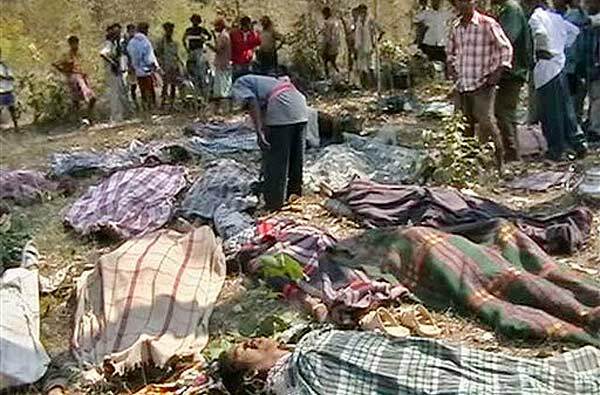 that naxalism grows due to the apathy of government towards these tribal regions. I don't know what reason they will provide for blowing up the existing schools, mobile communication towers etc. Of course they will offer reasons - In the country of 1.2+ billion people is there any difficiency for reasons? - like they are agents of the state (Which are supposed to be class enemies!!!). Just like our politicians- who religiously follow Lincoln's words (words only) "For the people"; they too are fighting for the development of people by blowing up schools, warehouses, communication towers, transportation vehicles etc!!! The sad part of the story is that our so called intellectuals from writers to politicians are ready to provide justification for everything they do, no matter whether it is the swift execution in the Kangaroo courts, blowing up the public transportation vehicles, hijacking trains etc !!! The number of people killed in the recent years are during the war between the Republic, 'Salwa judum' on one end and Naxalites are more than of the people killed in J&K and North - East India. The next in line to deny visa by Canadian authorities may be the security personals fighting for the nation in the Maoist hit regions in the name of heavyweight words like "notoriously violent", force which indulges in "systematic attack" and "systematic torture" etc. Lucky guys, they don't have neighbours like we have, external and internal threats like that of India. They didn't witnessed the dead bodies of thousands killed in every year due to terrorism. Indian lost a lot of security as well as civilians due to this long running Maoist campaign ( A campaign whose reasons are known only to them (The so called- establishing a state based on their ideology). The astonishing fact which differentiate this campaign from other insurgency activities is their support among the so called intelluctuals. But the sudden increase in violence and indiscriminate killing (before and) after the Lalgarh campaign - not only in Chhattisgarh, but also in Orrisa, Jharkhand, Maharashtra, WestBengal etc, killing EFR javans, Denthewada I and Denthewada II massacres, West Bengal train crash etc will results in the erosion of their support among the people. But the rising attacks on civilians and their raids on Police and Paramilitary forces shows their willingness to take the risk of alienating people. Which clearly shows their confidence to challenge the Republic on their own. But will they be able to continue in their path for long? Whatever happens, I don't think the republic will allow another partition or agree on the whims and fancies of Red Ultras. Moreover when some one declare war against state, majority of people will fall in line with that of state. Once development and fruits of Economic Liberalisation reach these areas, people will enjoy more financial freedom and a broder outlook. The propaganda of Naxalites will no longer be attractive not only to the common people but there will an erosion of support among there lines too. But for that to happen there should be peace and favourable circumstances, for that India have to fight with Naxalites. What the nation required is not the partial mandate (or partial will) of whether to go or not to go for a full blown out war but a firm decision to protect the unity and integrity of the country. It is not so difficult to take a choice, we saw the extremes in Panjab, Kashmir and North East. "At the beginning of a campaign it is important to consider whether or not to move forward; but when one has taken the offensive it is necessary to maintain it to the last extremity. However skilfully effected a retreat may be, it always lessens the morale of an army, since in losing the chances of success, they are remitted to the enemy. A retreat, moreover, costs much more in men and materials than the bloodiest engagements, with this difference, also, that in a battle the enemy loses practically as much as you do; while in a retreat you lose and he does not."